Webstorm 10.0.4 is better than 10.0.0, so I upgraded to WebStorm 10.0.4. 1. requireRE always comes before require. 2. document always comes after documentMode. exports.inspect = inspect; // actually, this is how Node.js export inspect function. var inspect = require('util').inspect // It saves a lot of time, because I can just add ';' to complete it. var inspect = require('util').inspect() // It's annoying because I have to type arrow and delete key to remove the parentheses. something will be changed, and you have to get used to it. I know I have to get used to it. But, in node.js, require is always the most popular keyword. 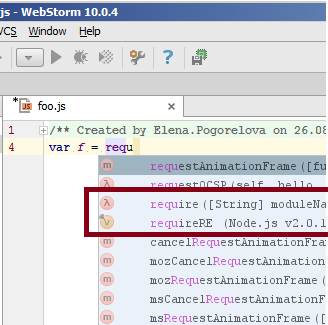 Why WebStorm autocomplete suggest requireRE ( in Node.js 0.12.2 Core ) before require? Is it possible to configure it to make require come first? You must have chosen the 'requireRE' previously... When you invoke completion for the first time, it sorts items alphabetically, but when some statistics is gathered WebStorm prioritizes more often used items. And, since I put require, it usually means that I want to import a function from a module. Why Webstorm guess that I want to call the function? Elena, the question was clearly "How do I change autocomplete suggestion sequence" not "why do you think it suggests x over y". If you don't know, just say so, or don't.